We are pleased to offer our guests before and after trip options for transportation and lodging. For an additional fee, Salmon Forks Outfitters can make arrangements for your before and after trip transportation and lodging needs. Arrive the afternoon of the day before your trip starts. If flying, (Glacier International Airport, Kalispell, Montana is your destination). 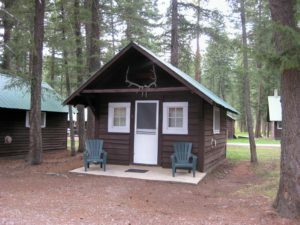 We can arrange a shuttle to meet you at the airport, and take you to Diamond R Lodge near our trailhead, where you will stay the first night. If you are driving, we will furnish directions to the Diamond R Lodge. Try to arrive no later then 1:30 or 2:00 PM in afternoon. First night lodging at the beautiful Diamond R Lodge, a two-hour drive into the mountains and situated on the Spotted Bear River. See pictures in our photo album. You will have your own rustic cabin. Take a hike, enjoy a great evening meal, including beverages, in their beautiful lodge or on their deck overlooking the Spotted Bear River. In the evening you can sit around a blazing campfire and just take it all in!! In the morning you will have a great breakfast, fix a trail lunch and then take a 30 minute drive to the trail head, where you will be assigned your horse for the week have a short orientation and head into the wilderness for a great adventure! Country Inn & Suites by Radisson is conveniently located at Glacier Park International Airport, in Kalispell, and offers a 20% discount for our hunting guests upon trip arrival and departure. If you have questions about making reservations with the special hunters rate, please contact Country Inn & Suites. For your convenience, stay your first and/or last night at the Country Inn & Suites by the Radisson. Country Inn & Suites boasts a quintessential Montana feel in property atmosphere, decor, and striking mountain views of the Swan range. 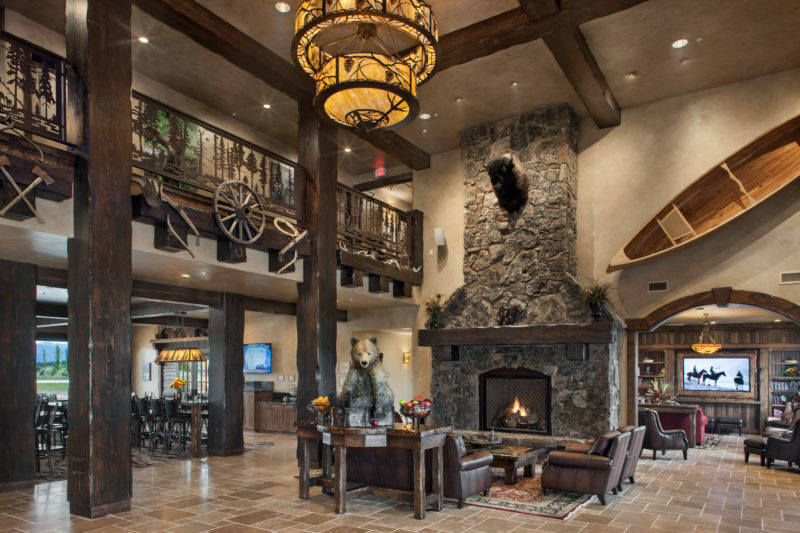 Additionally, Salmon Forks Outfitters and Swan Mountain Outfitters, offers shuttle services to-and-from Glacier Park International Airport, making this lodging option favorable. Cancellation & Refund Policy: For all hunts, $1000 per hunter is required to secure the reservation, a secondary deposit of $1,050 is required by June 1st the year of your hunt . Both deposits are non-refundable. If you do not get drawn we will refund a deposit, but will not for any other reason. The remaining hunt cost is due upon arrival, and there are no refunds due to weather or not harvesting an animal. Since all of our hunts are free chase, there is a chance you may not see an animal during your hunt. If the thought of going home without of an animal is not palatable to you, do not book a hunt! Above prices do not include tags/licenses that are paid directly to the state of Montana, or a Hunter Defense Fund fee of $50 collected of all outfitted clients of Outfitter members of the Montana Outfitter & Guides Association for the purposes of defending nonresident hunting rights in the state of Montana. All hunts are offered under Montana License #11300, Patrick M. Tabor 26356 Soup Creek Road, Swan Lake, MT 59911 (406)-387-4405. Cancellation & Refund Policy: For all hunts, $1000 per hunter is required to secure the reservation, a secondary deposit of $1,050 is required by June 1st the year of your hunt. Both deposits are non-refundable. If you do not get drawn we will refund a deposit, but will not for any other reason. The remaining hunt cost is due upon arrival, and there are no refunds due to weather or not harvesting an animal. Since all of our hunts are free chase, there is a chance you may not see an animal during your hunt. If the thought of going home without of an animal is not palatable to you, do not book a hunt! Above prices do not include tags/licenses that are paid directly to the state of Montana, or a Hunter Defense Fund fee of $50 collected of all outfitted clients of Outfitter members of the Montana Outfitter & Guides Association for the purposes of defending nonresident hunting rights in the state of Montana. All hunts are offered under Montana License #11300, Patrick M. Tabor 26356 Soup Creek Road, Swan Lake, MT 59911 (406)-387-4405.